Improved muscle strength and tone - to protect your joints from injury. Maintaining flexibility and balance, which can help you remain independent as you age. Weight management and increased muscle-to-fat ratio - as you gain muscle, your body burns more kilojoules when at rest. May help reduce or prevent cognitive decline in older people. Greater stamina - as you grow stronger, you won't get tired as easily. Prevention or control of chronic conditions such as diabetes, heart disease, arthritis, back pain, depression and obesity. Increased bone density and strength and reduced risk of osteoporosis. Improved sense of wellbeing - resistance training may boost your self-confidence, improve your body image and your mood. A better night's sleep and avoidance of insomnia. 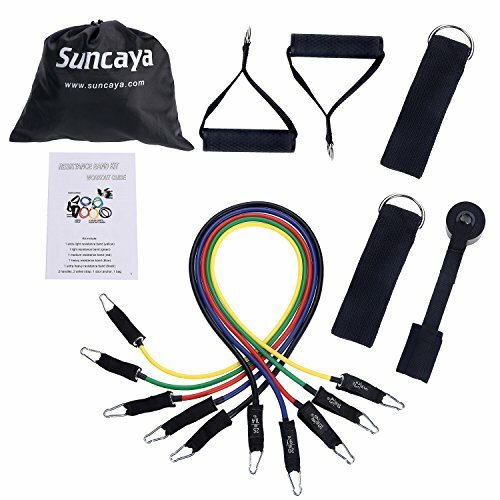 Why choose Suncaya Exercise Resistance Bands Set? 1. Made of the highest quality and eco-friendly natural latex which is extremely durable. 2. Five levels resistance bands can be used alone or stacked in any combination to reach your fitness goals. 4. Portable and Lightweight, portable gym, home gym, office gym and you can do workouts anywhere as you want. 5. These bands can be used for Physical Therapy, Recovery and Rehabilitation. 1 Yellow Band = 5 lbs. 1 Green Band = 10 lbs. 1 Red Band = 15 lbs. 1 Blue Band = 20 lbs. 1 Black Band = 25 lbs. If there are any issues with your product, just return it and we will refund your money or replace it free of charge. All bands are 48 inches in length, Yellow (5 lbs. ), Green (10 lbs. ), Red (15 lbs. ), Blue (20 lbs.) and Black (25 lbs. ), 1 door soft anchor, 2 cushioned handles, 2 ankle straps , 1 exercise chart and 1 carry bag. Made of the highest quality and eco-friendly natural latex, each tube band are double layered and carefully constructed to provide maximum resistance. These heavy duty bands can be used alone or stacked in any combination to reach your fitness goals, resistance levels are printed on the front of each. You can take these portable and lightweight resistance bands with you easily, you can do workout anywhere, your home, office or your trip, like a "portable gym". Our exercise stretch bands can be used for physical therapy, recovery, rehabilitation, body curve, fat burning and weight loss. If you have any questions about this product by Suncaya, contact us by completing and submitting the form below. If you are looking for a specif part number, please include it with your message.